Blast into PEI’s biggest and best Paintball park! Over 60 scale buildings and military vehicles on eight large fields, each with an authentic combat atmosphere. A wooded hilltop fortress, below ground trenches, fuel depot, D Day field, complete towns, castle and much more. Exciting and fun for seasoned veterans or first timers. Try our Low Impact Paintball. All the fun without all the “ouch”! Specialized equipment using a smaller paintball at a lower velocity takes away over 60% of the “ouch” factor. Perfect for first timers, smaller children (ages 8 and up) or players who just don’t like the sting. We take the “pain” out of paintball. New in 2017- introducing: MagFed Paintball. The most combat realistic experience possible. Don’t like to be shot at but would like to shoot others? Try our spooky new Zombie Apocalypse after-dark adventure. Wander through four acres of movie quality apocalyptic wasteland. Find the hidden clues to guide you to a series of objectives. Find the missing patrol, defend the ammo dump, locate the zombie vaccine locked in the secret laboratory and get back to civilization alive. All the while being attacked by hordes of ‘real’ flesh hungry zombies. You have a gun, the zombies don’t! This after-dark adventure is limited to ages 10 and up due to its scary nature. Fridays, Saturdays and Sundays at dusk all summer. No reservation required. 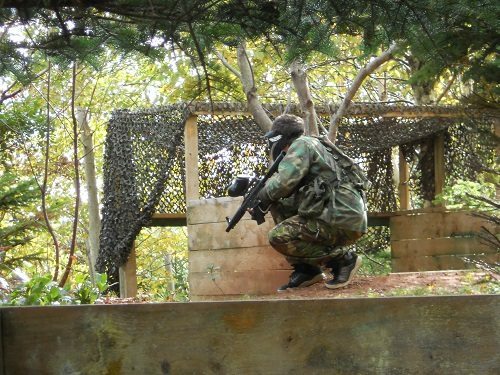 Crossfire Adventure Paintball is located in the heart of Cavendish beside the Ripley’s Believe It or Not! Museum, at Mariners Cove Boardwalk.